Whether you want to soak up the tropical sun in a luxury hotel or explore the hundreds of smaller islands that surround it, holidaying on the island of Phuket will prove to be an unforgettable experience. When the monsoon season subsides, Phuket’s beaches remain as inviting as they are beautiful for months at a time, and with water sports, shopping opportunities, plenty of nightlife and amazing excursions, Phuket truly has something to offer everybody. 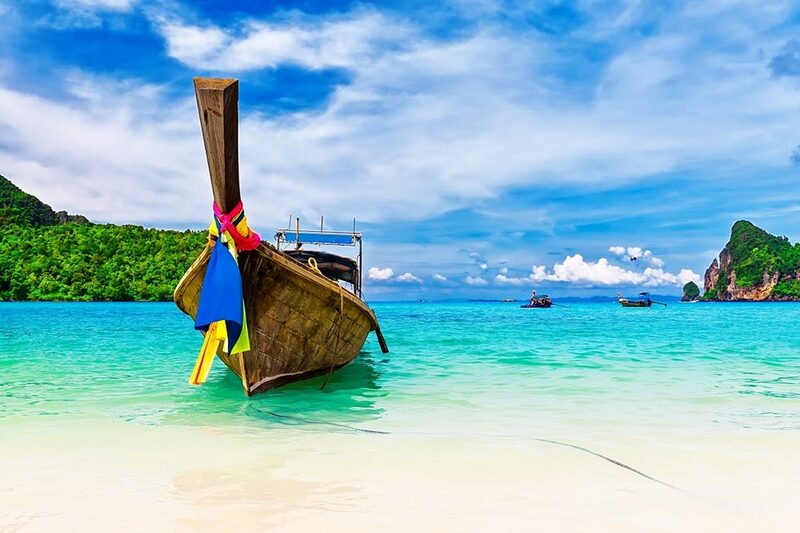 The fastest way to reach Thailand’s most popular island destination from the UK is to fly, and there’s no better way to start your journey than by booking business or first class flights to Phuket. Our luxury travel specialists are here to make booking your tropical adventure as straightforward as possible, so contact us today to learn more about our services. Cheap business class flights to Phuket are made easier with Just Fly Business. Our travel specialists will find you the perfect business class flights and offer exceptional value; all while striving to create and maintain long lasting relationships with you or your company through superior service. Our professional team will make the process of organising your business flights to Phuket hassle-free. Whether for business or leisure, your personal travel consultant will be able to find you the best business or first class flights to Phuket for your needs. The service doesn’t stop there either! We can help organise accommodation, car hire, transfers, tours, or parking as you require. One of the most significant and revered sites in Phuket, the Big Buddha is located between Chalong and Kata on top of the Nakkerd Hills. Standing 45 metres tall it is easily seen from a distance, and is accessed via road or a rigorous hike for those inclined. 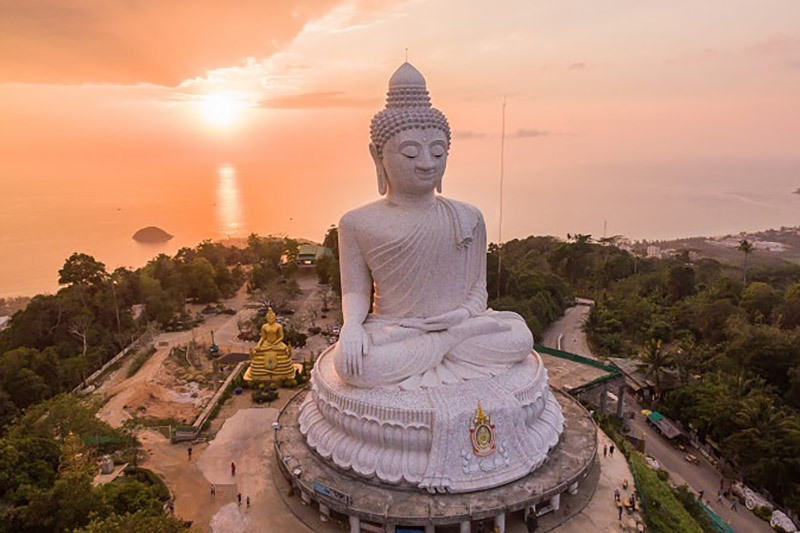 Upon reaching the summit, visitors are offered uninterrupted 360 degree views of the island stretching from Phuket Town, Karon and Kata Beaches, and Chalong Bay. Insider’s Tip: Due to its religious significance, visitors should ensure a modest standard of dress. Sarongs can be borrowed for free from the site centre if you are concerned about appearing disrespectful. Always a great night out with laughs, music and talented performances, Simon’s Cabaret has become a permanent feature for visitors since it began in 1991. Welcomed into the luxurious theatre you will notice the attention to detail in not just the surroundings but in the hosts and performers. As they say though, “Knowing their secret won’t make you believe your eyes any less”. Let loose for the night and enjoy a colourful extravaganza with amazing costumes and set designs! Famous for its role in many blockbuster movies such as The Beach, a day tour of the Phi Phi Islands is a fantastic way to experience this tropical paradise. Take either a speedboat or a traditional Thai longboat out from Phuket and be astounded as the islands rise from the azure waters with its jagged cliffs and lush vegetation. On arrival to Koh Phi Phi Lee, the smaller of the two islands, Pileh Lagoon opens up with imposing rock faces leading down into crystal clear water that is sure to invite. The crowning glory comes on the other side of the island as you enter Maya Beach, a secluded cove almost entirely enclosed. The largest island, Koh Phi Phi Don, offers visitors the chance to extend their stay overnight in several accommodations from luxury to budget, and is surrounded by calm blue waters with a myriad of marine life, perfect for snorkling! Without any vehicles on the islands it is easy to let cares fall away and just relax and enjoy the laid-back lifestyle. 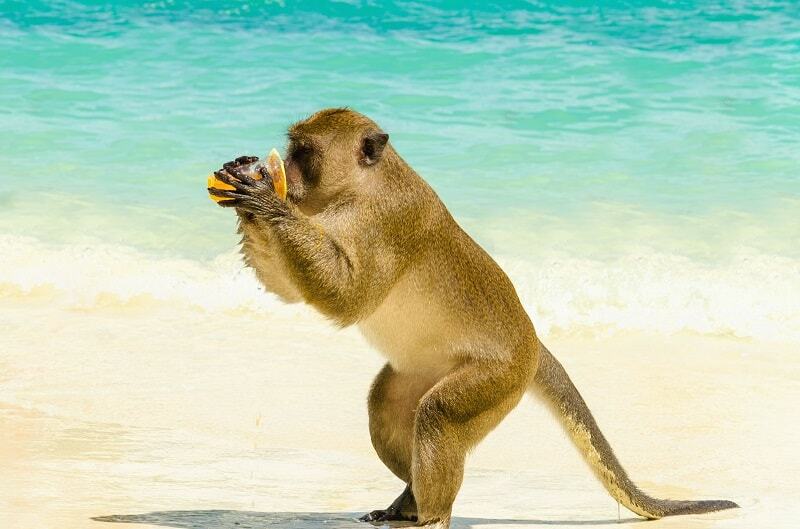 Insider’s Tip: The beaches and surrounding forests are filled with monkeys that, while cute, can be mischievous by stealing belongings and occasionally biting tourists. Like a smaller version of Halong Bay in Vietnam, Phang Nga Bay is a major attraction for a day trip from Phuket. With many stunning limestone islands rising from the waters in the bay, the best way to see them is on a boat tour from the north end of Phuket Island. James Bond Island and Koh Panyee are the more famous of the islands in the area and can draw a large crowd at all times of the year but well worth the visit! No holiday to Phuket should be all about exploring. Be sure to make time to simply relax and enjoy the many beaches on the island. The large beaches near Patong, the main tourist area on Phuket, can get very busy and crowded with lounges. For families it is much better to head to Kata Beach where there is less crowding and for couples, the smaller area of Kata Beach (Kata Noi) offers secluded areas for more privacy. Located on Kata Noi Beach in a private and secluded area, the Katathani Beach Resort is the perfect venue for small businesses, with a combination of small and large meeting spaces and exceptional services. 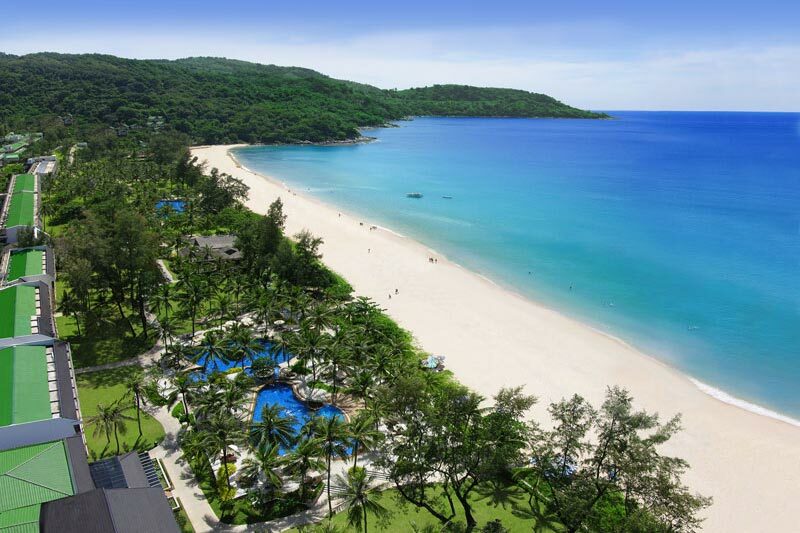 Situated at the north end of Patong Beach walking distance to the busy heart of Patong but remote enough for some peace and quiet, the Novotel Phuket Beach Resort offers business with a choice of 8 meeting spaces. A short domestic flight from Phuket, Bangkok, the capital of Thailand, is easily accessible to create a two-centre holiday itinerary. Pair a city break in this bustling metropolis with a relaxing beach break in Phuket to get the best of both worlds! With fantastic connections from the UK, Kuala Lumpur is a popular choice for travellers on their way to Phuket. Highlighted by landmark architecture, fantastic cuisine, and stunning natural beauty, the city surprises most with what it can offer as a stop-over option. For lovers of tropical islands, the east coast islands are less populous than Phuket and have a more relaxed atmosphere. Koh Samui is the easiest to reach with its own airport, Koh Phangan has become famous for its Full Moon Parties but can be an ideal choice outside of these areas and times for those looking for a more traditional experience, and Koh Tao is a small island with fantastic luxury accommodation for people looking to remove themselves from anything stressful. It also boasts some of the best diving in Thailand! Why Fly First Class to Phuket? Thanks to the experts at Just Fly Business, there’s no need to settle for a cramped seat on a long-haul flight to Phuket. We specialise in sourcing exceptional value first class flights to a countless number of top worldwide location, but as anybody who’s been here before will tell you, Phuket is a must-visit destination, especially for those who love nothing more than a couple of weeks in the sun. On board business and first class flights to Phuket, you can get well rested on a fully reclining seat before touching down. Alternatively, you can enjoy sipping champagne, watching the latest blockbuster films or playing games with your friends and family as you take to the skies. With onboard Wi-Fi, you can stay in touch with those on the ground and get on with your work, and you’ll never go hungry thanks to the range of tasty chef-cooked delights on offer. In addition to first class flights, our travel specialists can help you organise luxury resorts, transfers, car rentals, parking, tours and much more. You can trust us to go above and beyond to ensure your holiday provides you with the relaxation and luxury you deserve. Ask our friendly and professional team for your first class flights to Phuket today on 0208 417 1366. Hottest Months = Phuket is hot all year round but has a wet season between May and November.